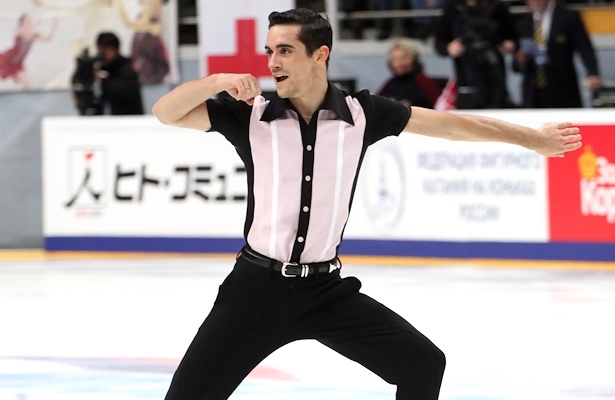 Javier Fernandez of Spain performs his long program at 2016 Rostelecom Cup. Javier Fernandez of Spain came from second place to claim the gold at the 2016 Rostelecom Cup in Moscow, Russia, overtaking overnight leader Shoma Uno of Japan. Fernandez, who had drawn to skate last, gave a stunning performance of his entertaining Elvis Presley routine. The World champion played with the crowd, used his show talent and provided the “hardware” seemingly effortlessly: three quads, two triple Axels and four other triples. The only thing he found to criticize himself was the fact that the final combo spin was rated a level two and the step sequence a level three. The Spaniard scored big, 292.98 points. He would have cracked the 300-points-barrier again if he hadn’t popped the Salchow into a shaky triple in the short program. Uno pulled off his quad flip and a quad toe-triple toe combination in the short to take the lead, but both jumps were a bit wobbly. A quad flip and one quad toe worked again in the long, as did the triple Axel, but he crashed on the second quad toe. Overall, the music of Uno’s Tango long program is a bit heavy for him and he can’t sell it like Fernandez sells Elvis Presley. Still, 285.07 points and the silver are nothing to sneeze at and Uno is the first man to qualify for the Grand Prix Final this season. Alexei Bychenko’s bronze medal came as a bit of a surprise, but the Israeli skater earned it with two strong performances that included quad toes and triple Axels and he made no major errors. The European silver medalist totaled 255.52 points and moved up from fourth in the short program. Mikhail Kolyada of Russia was third after a good short with a beautiful quad-triple toe, but he lost his chance for a medal when he fell on a triple Lutz and doubled a loop in his free skating. He placed fourth (245.30 points). USA’s Max Aaron disappointed in the short, but the “Lion King” free was much better and he moved up to fifth at 235.58 points.